It was the 3rd weekend hunting in South Dakota and my 8th day of actual hunting. It was approximately 8 am and I rattled in 2 bucks. 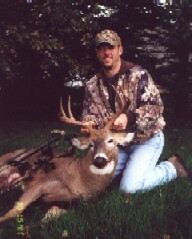 A small 8 and a small 10-pointer. I was deciding if I should take the 10-pointer, when I noticed another 8-point buck coming from the other direction. He had his ears laid back and he walked stiff-legged toward the other two bucks. He was obviously an older buck, at least 2 1/2 maybe 3 1/2 years old. I still was not sure if I should try for this buck, but he walked directly beneath my stand, and toward the other two. About the time when he got by the other two bucks, the breeze shifted, and I noticed that they all went on high alert. It was now or never and I decided to take the old 8-pointer. It was about a 20-yard shot. I took him high through the lungs, but the arrow also hit the spine and he went down in his tracks.